In the internet, there are so many sources of ideas for making homemade worm bins for vermicomposting purposes. Homemade worm bins would range from office or desk bins to pails and buckets. Typically they would have similar ideas on how vermicompost and vermicompost leachate (sometimes called worm tea) are harvested or collected. Then there are the commercial versions which are vertical worm farms like the Worm Factory 360 and the Can-O-Worms models. These use the stacked trays concept. In this theory, composting worms migrate upwards from one tray to another. This happens when the lower tray is depleted with food and new fresh food is added in the upper tray. This is where the composting worms stay and feed on kitchen waste. They're sometimes called compost processing trays. You can have 2 or more of these feeding trays stacked one on top of the other. Also called the leachate collection tray, this is the bottom component of the worm bin setup. 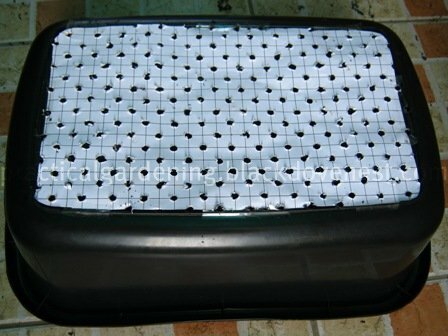 The drain tray collects the vermicompost leachate which is sometimes referred to as worm tea. This covers the topmost feeding tray. It prevents insects and rats from casually crawling into the top feeding tray. 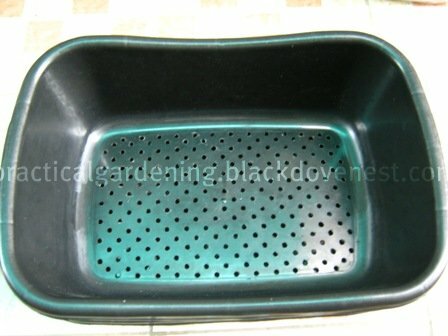 It also provides ample aeration for the decomposing vegetable matter in the feeding trays. Adequate air circulation prevents the formation of anaerobic bacteria that contributes to bad odors. This lid, placed on the top feeding tray, provides a tight seal so worms do not escape. It is only used in infrequent occurences when composting worms try to escape. Depending on your circumstances and materials available to you, you may use the ideas discussed below to suit your needs. Some of the materials used in this homemade worm bin setup are from discarded materials like old pvc pipes, window screen, mosquito or nylon netting, nylon string, garter, etc. Alternatively, these items may also be purchased in hardware stores and shops. The worm bins themselves are actually rectangular plastic basins that were bought very cheaply at a wholesale price of Php 26. That's equivalent to roughly $ 0.50 apiece if you buy a dozen. These plastic bins are heavy duty and are all colored black. Composting worms supposedly "like it dark", so the black color helps. The plastic bins initially had a strong "plasticky" odor so I filled them with water and set them aside under the sun for 3 days. Hopefully the water absorbed whatever residual toxicity still present on the surface of the bins. On a blank long-sized bond paper, draw grid lines that are spaced 1/2" apart. Mark on the intersection of the grid lines on the pattern paper where you intend to put drill holes. These will be the drill points. The grid-lined pattern paper does 2 things: It allows ou to evenly-space the drill holes from each other; and it allows you to have a consistent regular pattern for the drill holes. An easier way to create this pattern paper is to use a software to draw the desired pattern and then print it on the long-sized bond paper. Turn a rectangular plastic bin upside-down so its bottom is facing up. Affix long narrow strips of double-sided tape at strategic areas of the back of the pattern paper, like the edges, corners and middle areas. Avoid taping over the drill points on the grid lines. The purpose of the double-sided tape is to allow you to drill on the pattern paper and through the plastic bin or feeding tray's bottom. Remove the backing strips on the double-sided tape and press the pattern paper firmly at the bottom of the feeding tray. 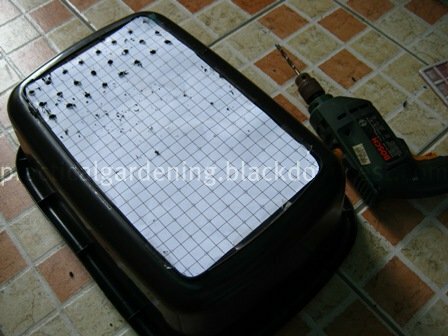 With a power drill, drill 5/16" holes on the drill points of the pattern paper and through the feeding tray's bottom as shown below. The 5/16" diameter holes should be large enough for the composting worms to pass through in the migration from lower trays to the upper trays. Shown below is the completed drilling of all the marked holes on the pattern paper. After completing all drill holes, remove the pattern paper and deburr the holes with a round file, as needed. Shown below is the completed feeding tray for the worm bin setup.